Selected the 2010 Southern Living® Member Builder of the Year. Sasser Construction has been building superior homes since 1986. 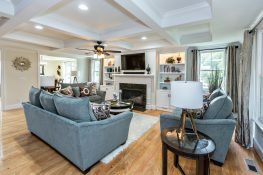 Because of their attention to detail, and strong presence in the marketplace, Sasser Construction has been selected as a Southern Living Custom Home Program builder. “We love to give customers what they want, custom homes from conception to creation.” Sasser Construction’s goal is to build the highest quality home– combining their commitment to excellence with value and customer satisfaction. At Sasser Construction their philosophy of “It’s A TEAM Thing” embraces the fact that success comes naturally to an experienced group. With unified priorities and a commitment to achieving more, their team will build your home with superior craftsmanship and achieve the exceptional results you want. See Sasser Constructions’s Craftsman Cottage Showcase Home, The Lorelei, here. To see a Photo Gallery visit https://www.founderspointe.com/lorelai-sasser-construction/. To see Sasser’s Modern Farmhouse 2016 Parade of Homes Model, check out the slideshow video below. Check out their 2010 Homearama model home, The People’s Choice Award Winner. The Modern Farmhouse showcase home plan features an award winning kitchen ftom the 2016 Parade of Homes event.